Today I welcome a special guest author: John Wayne Falbey, who has recently published his first novel, a political thriller, SLEEPING DOGS. I've read and reviewed the book and can highly recommend it for those of you who enjoy Lee Child's Jack Reacher novels and David Baldacci's novels. The ideas mostly come from life, from observing the human condition and from studying the developments taking place in the world. I season that with a measure of my own experiences. How do you create the characters in your stories? I’m a people watcher. The habits and behaviors of others fascinate me. In creating and animating the characters in my stories, I pull together a composite of people I have observed. Is there any of your own personality in any of your characters? I believe most authors find an irresistible urge to inhabit one or more of their lead characters, at least to some extent. In my case, I have to admit that each one of the Sleeping Dogs reflects traits of my own personality. Scary thought, isn't it? Are there “keys” to becoming a writer of fiction? Yes, among the most important is to a voracious reader yourself. The more you read among a wide variety of writers, the better your own skills will be. You don’t want to try to mimic someone else’s style, but exposure to many, many styles will help you find your own “voice”. There are two general categories of writers who have influenced me. The first are the classical chroniclers of heroic deeds and writers of adventurous tales, such as Herodotus’ Histories, Xenophon’s Anabasis, One Thousand and One Nights, the Song of Roland, and others. The second category includes more modern writers from Raphael Sabatini to Dashiell Hammett, Raymond Chandler, John D. MacDonald, Elmore Leonard, and Robert B. Parker. Current writers in the thriller genre who I greatly admire include Lee Child, Brad Thor, David Baldacci, Vince Flynn, and Alex Berenson. 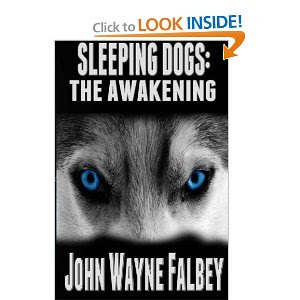 Is Sleeping Dogs: The Awakening your first novel? It’s my first published novel. I wrote a novel length manuscript as a student at Vanderbilt University School of Law years ago. My undisciplined nature needed some sort of escapist diversion to cope with three years of mind-numbing regimentation and seemingly endless case briefing. Why didn’t you publish that book? I almost did. A senior VP at Harper & Row (now HarperCollins) liked it, but believed that the protagonist, as an anti-hero, would not be embraced by the reading public. He wanted me to rewrite it so a minor character, a nebbish, was the protagonist and my anti-hero would become part of the wallpaper. I had neither the time nor interest for rewriting it, so I tossed it on a shelf and forgot about it for many years. As an ironic postscript, right after that, the print and film media exploded with popular anti-heroes. Steve McQueen and Clint Eastwood, among others, became box office icons in those kinds of roles. John D. MacDonald’s Travis McGee and Robert B. Parker’s Spenser went on to sell millions of novels. And today there is no more imposing or popular an anti-hero than Lee Child’s Jack Reacher. Do you have plans to publish that book? I recently located the manuscript and am in the process of editing it. It should become available in late summer, 2012. Will there be more books about the Sleeping Dogs, and, if so, when will the next one be available? I plan to write two more books in this trilogy about Brendan Whelan and his genetically evolved colleagues. My goal is to publish the second book, Endangered Species, in the summer of 2013. The third book, End Game, is planned for release in mid-2014. “He Who Drinks From Lethe...”, a morality tale in short story form with dark, neo-gothic undertones has recently been published. It takes place today deep in the heart of the Everglades. It can be read in its entirety on my website or purchased from amazon.com, Smashwords.com, or barnesandnoble.com.